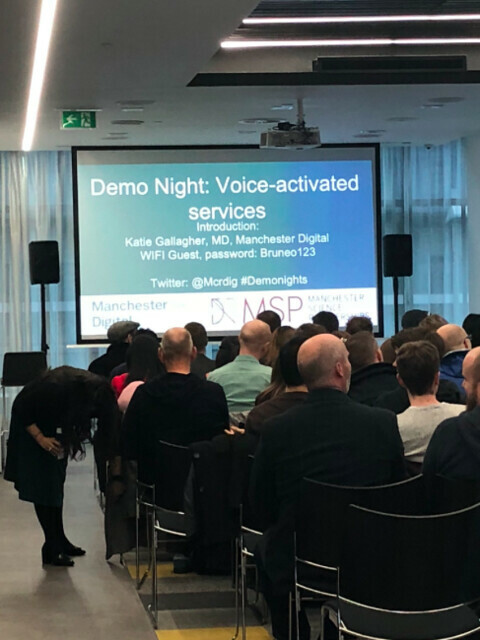 Demo Nights are an event series we host to showcase the exciting developments in the tech sector in Greater Manchester. As with all our events, Demo Nights are a great opportunity to learn, network and celebrate our vibrant industry. Demo Nights appeal to anyone interested in the latest tech developments, but are particularly popular among developers, CIOs, CTOs and solution architects and engineers. Previous topics covered include AI, machine learning and voice-activated services. Sessions include lightning talks and the chance to try the tech hands-on. See the gallery below for a flavour of Demo Nights. For the latest Demo Nights information and to book tickets for the next event, click here. If you'd like to build your brand awareness by sponsoring a Demo Nights event or series of events, download the sponsorship pack or get in touch with Helen.